Conviction, commitment, conscientiousness – an accurate alliteration describing Jason and Brandography. Conviction in his ideas, commitment towards his work and conscientiousness in his approach. Jason believes website management requires way more than creativity. “In essence, you never really arrive” commented Jason. “Too often web marketing firms achieve a level of success and then put their client’s marketing campaign on auto pilot. That just isn’t good enough. Read ahead Jason's story in which he talks about Brandography's beginning, website marketing and tips for business owners. What does Brandography have to offer? 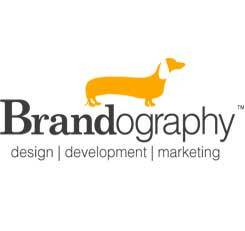 Brandography creates, executes and manages the online marketing services that businesses need to thrive and succeed. We design and develop websites, graphics, videos and a multitude of campaigns like pay-per click campaigns, social media campaigns, etc. Brandography’s web marketing spans from conception to execution and then continues on to manage the website, so our customers get a great return. The fun began in 2008 (in the basement of my home!). Brandography now has a staff of 11 people - and growing and we’re loving our new headquarters located in the popular Loring Park area in downtown Minneapolis. Any prior experience in web marketing? Actually, I received a bio-medical degree and then studied business in college. But shortly out of school, I realized that in the business world, web marketing and web design development was typically managed from only a creative aspect and it became my goal to integrate a scientific and experimental approach to web marketing. How do you manage a multitude of clients and a heavy workload? Great question! Because at Brandography, we provide the same level of personal, customized service for small companies with only a couple employees as we do for large organizations with 10,000 employees, we depend on excellent project management tools. We’re a one-stop-shop for web marketing providing the services of website developers, graphic designers, videographers, content writers and marketing strategists. Projects extend from developing websites, logos, creating video and actually launching a company's website and creating mobile apps. And Brandography doesn’t stop there! We then market the business website with Google ads, online social media marketing campaigns, etc. and concisely report back to our customers with their campaign results – in easy to interpret language. Obviously with the scope of services Brandography offers, project management is key – a valuable service Zoho provides. What do you love about your job, Jason? I honestly love helping individuals and businesses reach a higher level of success. I love interacting with so many diverse companies from completely different fields all with divergent goals and providing them with customized creativity and services. At Brandography, how we do something is as important as what we do. We strive to provide excellent web marketing services in a manner that makes the process not only successful but also enjoyable for the business owner. We make web marketing simple, use easy to understand language (no high-tech jargon) and use timeless good business practices of valuing and respecting our clients. Brandography has a great team of professionals who excel at what they do – so what’s not to love! Any advantages or disadvantages when working for yourself? Yes and yes. I think the advantage and the disadvantage are one and the same and that is - it’s up to you. If you succeed or if you fail – it’s up to you. It's an advantage because I don't have to be limited by somebody else to succeed and it's a disadvantage because there are no guarantees. What advice would you give someone starting their own business? First and foremost create a plan – but not just a marketing or an advertising plan. A solid plan including infrastructure detailing how you’re going to handle heavy workload and manage your projects, customers, database, invoicing, etc. You need to have a plan to not only develop your business but also to sustain your business … I would tell them to use Zoho. What got you started using Zoho? Zoho was highly recommended to me by a business friend. I began using Zoho Projects first and then got introduced to Zoho Invoice. Both were extremely intuitive, easy to use and didn't take much time to set up. My Zoho services were up and running in just a few minutes. What do you appreciate about Zoho Invoice? Zoho Invoice integrates so seamlessly with popular online payment services. I love how easy it is to pull up an invoice on my mobile phone or my iPad and send it via email on the spot. My customers can pull out their credit card and make a payment immediately and it reaches my bank account in just a couple of minutes. Zoho keeps track of all the money and sends the monthly recurring invoices – it’s so efficient and easy to use! As a business owner, Zoho has saved me a lot of time, headaches and the need to hire additional staff. Thanks for providing Brandography with your great services and for supporting our success!